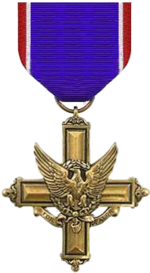 The Distinguished Service Cross (abbreviation DSC) is the second highest military award that can be given to a member of the United States Army. [a] It is awarded for extreme gallantry and risk of life in actual combat with an armed enemy force. Actions that merit the Distinguished Service Cross must be above those required for all other U.S. combat decorations, but are not high enough for the Medal of Honor. The Distinguished Service Cross is the same as the Navy Cross (Navy and Marine Corps). The Air Force) has the Air Force Cross and the Coast Guard has the equivalent Coast Guard Cross. All are equivalent (equal) awards. ↑ Before 26 July 1947 this included the United States Army Air Forces. After that date the Army Air force became the United States Air Force, a separate service. This page was last changed on 18 December 2018, at 12:05.